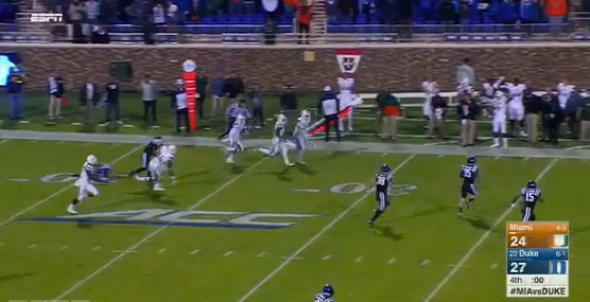 ACC suspends officials over Duke-Miami return botches. Miami beats Duke 30–27 on the last play of the game. Update, Nov. 2, 2015: The Atlantic Coast Conference, which counts both Miami and Duke as members, announced on Sunday that officials made four (!) different mistakes during the loony kickoff return and its aftermath, two of which would have negated the touchdown and one of which would have ended the game immediately as a Duke win. The entire officiating crew (seven on-field officials and two off-field officials) has been suspended for two games.